Akshay Kumar to be Seen with Ace Actresses like Taapsee Pannu, Radhika Apte & Swara Bhaskar in Upcoming Films! Akshay Kumar has recently wrapped up his 2 films, one Toilet: Ek Prem Katha with Bhumi Pednekar and other Padman with Radhika Apte. Now, he is ready to work in Gold with another ace yet non-fame actress Swara Bhaskar. Akshay is currently shooting with Taapsee Pannu for Naam Shabana in Malaysia. The actor is out to work with ladies who have proven themselves in the films they have done. 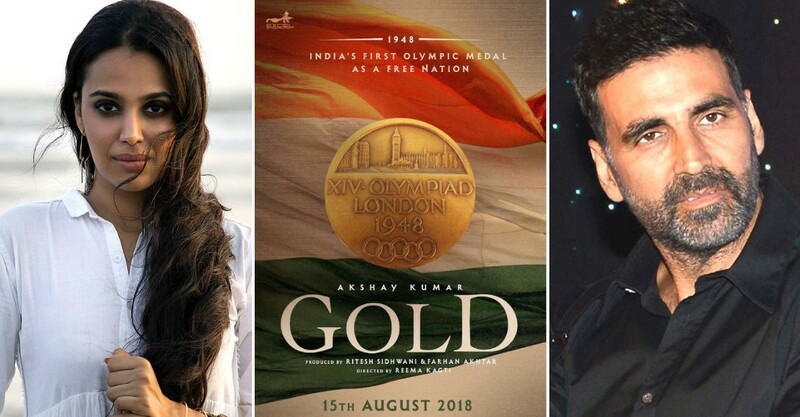 The film, Gold is set in the backdrop of 1948, produced by Excel Entertainment is slated to release on 15th of August next year. The story-line is set in the era of 1948 when India got the Independence from the hands of Britishers and won a Gold medal at the Olympic games held in London. Here is the first poster of the film shared by Akshay Kumar on Twitter, "Gold"
On finding the apt actress for the movie, the team wanted to have one with acting prowess. After doing a lot of search, they ended up with Swara. Her last film was Nil Battey Sannata, which performed critically and commercially well. Also, the film features a requirement of yet another talented actress. The team will soon find her.